The neologism „Time Acupuncture“ wants to illustrate the combination of the energetic of the time with the energetic of the acupuncture. Through the coordination of these energetic cycles we are able to optimize the effectiveness of the acupuncture treatment. We treat in the manner of the old masters. Somewhere within the twelfth and thirteenth century, a period known as the Jin- and Yuan-Time, the two classical methods Zi Wu Liu Zhu Zhen Fa and Ling Gui Ba Fa with two subcategories each were introduced by Dou Hanqing and Xu Feng. 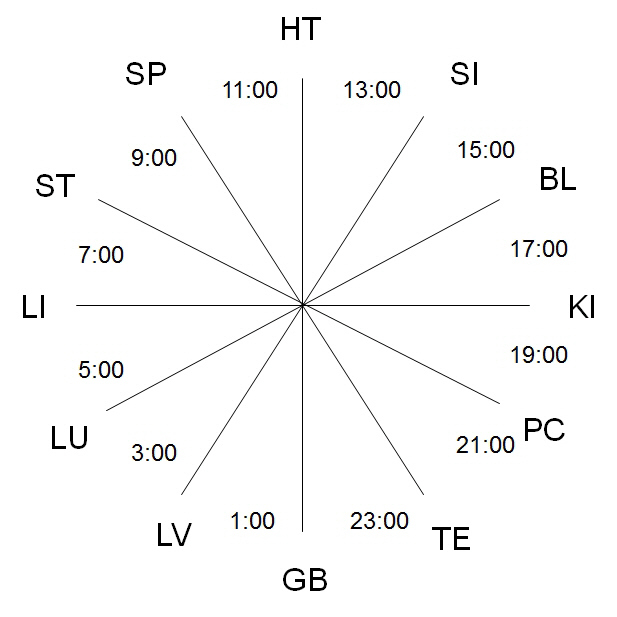 A cyclical perception of time is used in time acupuncture. The year, the month, the day, and the Chinese double hour are examples of such cycles. Each cycle is further subdivided. In that way a year includes twelve months, and a day includes twelve time divisions or Chinese double hours. Each time unit is characterized by Yin or Yang and by one of the five elements. These daoistic concepts are well known in acupuncture. Here we find the subdivision in twelve as well as for example in the twelve meridians. It is obvious that time and acupuncture – both characterized by the Yin-Yang polarity and the five elements – can be aligned and correspondingly combined. Detailed background information about the time based acupuncture methodes Zi Wu Liu Zhu Zhen Fa und Ling Gui Ba Fa can be found in the script „Theoretical Basis and Concepts“, which is enclosed to the Wheel of Time Acupuncture. This script will answer your questions whenever you look for information beyond the applications of the „Time Acupuncture App“ or the “Wheel of Time Acupuncture”. At the time of the constitution of the classical methods of time acupuncture the present-day clock time was unknown. Solar time was the reference. The old Chinese masters based the time acupuncture on the knowledge that physiological functions are regulated under the dictatorship of the sun. This knowledge is confirmed by many findings of modern chronobiology. Therefore, contemporary acupuncturists using Zi Wu Liu Zhu Zhen Fa and Ling Gui Ba Fa have to adhere to the defined prerequisites of the methods. That means any local clock time has to be converted into the current solar time. The calculation of solar time from local clock time, however, is complicated and in the daily clinical routine too time consuming. There are many publications available about the topic. However, for the calculation they generally offer little feasible assistance. This problem is sorted out by the new Time Acupuncture App. Thereby the classical time based acupuncture methods are simple and reliable to apply. The shade of the clock hand points on the marker 13:30. This corresponds to the local clock time according to the winter time. However, the correctly calculated solar time for our example would be 13:01 (see Local to Solar Time Calculator). 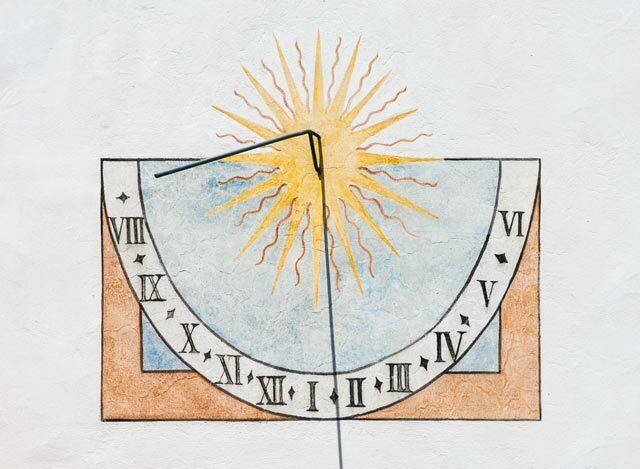 Thus, the sundial of Siebeneich doesn’t display the correct sundial time, as a real ancient sundial shoud do it. Explanation of this inconsistency: The clock face was painted on the chapel in a way that the clock hand displays the local clock time without considering a possible daylight saving time instead of the solar time. A common translation of Zi Wu Liu Zhu Zhen Fa is “The Midnight-Noon Ebb-Flow Acupuncture Method”. The terms Zi Wu and Liu Zhu refer back to the classical books of Huang Di Nei Jing (around 200 BC) and Nan Jing (around 200 AD). This form of time acupuncture is often referred to as astronomical acupuncture. It treats, primarily, the pathologies of the twelve main channels and employs the five transporting-shu points in addition to the yuan-source points on the yang-channels. Two basic forms are distinguished here. The first method, Na Zi Fa, utilizes the earthly branches. The second method is called Na Jia Fa and it utilizes the heavenly stems. All acupuncturists will probably know the Zi Wu Liu Zhu Zhen Fa – Na Zi Fa method. It includes applications according to the meridian clock. Na – 拿 – means to take or make use of and Fa – 法 – means method. Zi – 子 – is the first earthly branch and stands for the earthly branches in general. Na Zi Fa – 拿子法 – “Take or Use the Branch Method” – is the method that works with the earthly branches. This is considered the easiest method of time acupuncture. It is based on a combination of the twelve time divisions of the organ clock and the five transporting-shu points. The theoretical background of the system is, on the one hand, supplied by the organ or meridian clock with its assignment of the earthly branches to the channels and, on the other hand, the five transporting-shu points with their classical indications as well as with the rules of the five elements. These strategies will be explained in detail in the Time Acupuncture App. 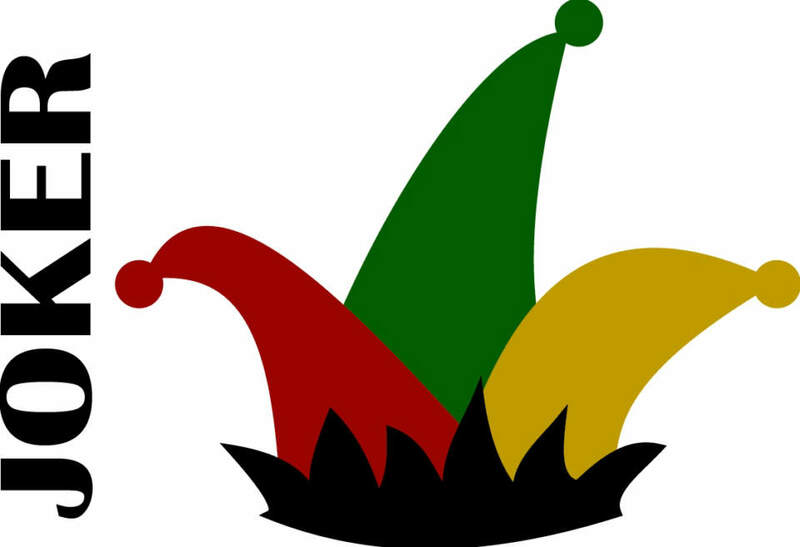 We call the Na Jia Fa points “Joker Points” because of their efficiency. Na Jia Fa is the second method of Zi Wu Liu Zhu Zhen Fa. The open points result from the integration of many energetic concepts of Chinese medicine. Na – 拿 – means to take or make use of and Fa – 法 – means method. Jia – 甲 – is the first heavenly stem and stands for the heavenly stems in general. Na Jia Fa – 拿甲法 – “Take or Use the Stem Method” – is the method that works with the heavenly stems. The treatment takes place via the eight extraordinary channels. It is important consider their specific energetic intent (see indications). Ling Gui Ba Fa includes two methods which are Ling Gui Ba Fa – Original Style and Fei Teng Ba Fa, a simplified form of the Ling Gui Ba Fa. These methods are described as numerical acupuncture in contrast to astronomical acupuncture, which refers to the Zi Wu Liu Zhu Zhen Fa. What is most important to remember here is that in going over these channels you reach the yuan or constitutional level. From this point of view you treat primarily conditions over the eight extraordinary channels which deal with the essential value of the jing – 精. The very nature of these maladies tends to be chronic, serious, or may even be inherited. A further indication for the use of an extraordinary channel becomes apparent through the path of this channel which can include several of the twelve main channels. The extraordinary channel “Yang Wei Mai”, for example, contains the area of the BL-, GB-, SI-, and TE-channel. In other words, treatment through an extraordinary channel allows for coverage of a much wider area than treatment through a main channel. And finally, the extraordinary channels offer a good option for treating polarity conditions. By this I mean conditions of imbalance between both sides of the body and its channels. Consider using the extraordinary channels to balance these polarities. The commonly used left-right and top-bottom confluent point combinations are most suitable for these problems. Ling – 灵– means effective or imbued with spirit. 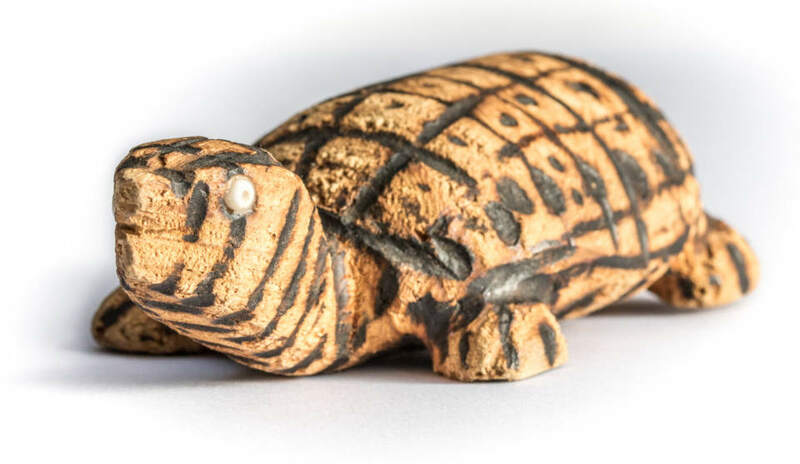 Gui – 龟– is the turtle. Ba – 八 –means eight and Fa – 法 – means the method. The common, symbolically rich, translation of Ling Gui Ba Fa – 灵龟八法 – can be taken as the “The Eight Methods of the Magic Turtle“. Fei – 飞 – means to fly. Teng – 腾 – means soaring. Fei Teng Ba Fa – 飞腾八法 – can be translated as “The Eight Techniques of Soaring“. Ling Gui Ba Fa as well as its simplified form called Fei Teng Ba Fa – the Eight Techniques of Soaring – combine the eight extraordinary channels with insights from old daoistic knowledge: “He Tu” (“The Yellow River Chart”) and the “Luo Shu” (“The Luo River Diagram”), the eight trigrams in the early heavens order according to Fu Xi and the later heavens order according to Wen Wang, as well as the theories of the heavenly stems and the earthly branches.